Since we travel so regularly, I’m always on the lookout for fun games and toys that are a) inexpensive and b) compact to take along on our travels. So I was thrilled to find the Imagine I Can tinned games by Manhattan Toys. 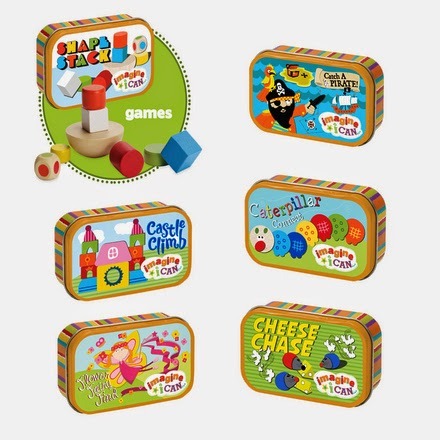 Manhattan Toys have created a clever and cute series of games and toys for ages 3 and up which pack away in their own tins. My favorites are the most compact games, priced at about $6 each depending on the retailer. Just slightly larger than a deck of cards, these games are perfect for traveling! B and I have been enjoying the Catch a Pirate game and instructions are provided for standard play and modified play for beginning players. With little pieces, these games aren't particularly well-suited for play in the car or on an airplane (I wouldn’t want to crawl under my airplane seat each time a piece is dropped!) but they are just the right size for packing in your carry-on for keeping busy at the airport, on a cruise ship or in a hotel room.